Here in Alaska, the National Park Service has taken the first steps to plan for a changing climate where the consequences – like melting glaciers, migrating wildlife and thawing permafrost — are showing up earlier and proving more dramatic than those predicted for lower latitudes. With that in mind, Alaska’s regional park service became the first in the country to begin the daunting process of planning for effects that no one can predict with exact certainty, but which will undoubtedly shape the future of all public parklands. “Our feeling is, both according to the models and empirically in what we observe, climate change is moving faster in Alaska than it is in other areas, and consequently, we really need to be thinking about how that’s going to affect the decisions we make,” said Robert Winfree, Alaska’s regional science advisor for the National Park Service. In the past fifty years, Alaska has warmed twice as fast as the rest of the country and is expected to warm by another 3.5 to 7 degrees by 2050. This could mean, for example, less food for caribou but more spruce beetles, which bore into and kill trees. But the point isn’t the effects, really – it’s that even though change will happen, the extent and nature of this change remains uncertain and the National Park Service must plan in the absence of knowing what exactly it’s planning for. The Department of the Interior issued a secretarial order back in 2001 directing all offices and bureaus, including the national park service, to consider the effects of climate change in planning and management and left it to each state to work out the details. With funding in hand, Winfree enlisted collaborators at the Scenarios Network for Alaska & Arctic Planning (SNAP) at the University of Alaska Fairbanks, who used data from global climate models to project best, worst and medium-risk climate scenarios for each of the state’s 23 national parks, which account for 75 percent of the nation’s national parks by area. The team then organized five workshops across the state over two years and invited park employees, community members and staff from partner agencies like U.S. Fish and Wildlife Service to participate. In these workshops, participants discussed and outlined the many “futures” that could emerge for Alaska’s parks with climate change, like having more forest fires or losing buildings to melting permafrost. Based on these futures, participants brainstormed preemptive decisions which park staff could make right now to lessen these impacts. The exercise was meant to empower staff with the ability to confront climate change in a clear, actionable way. Winfree is now busy whittling down a list of 400-500 suggestions of proactive steps that park staff can take in the short term posed by workshop participants. The Alaska region of the National Park Service will soon publish five reports on the process, and debut an educational booklet in all of the state’s national parks this summer to show how climate change is already impacting the parks. They also collaborated with the federal park service on a scenario planning handbook to aid other parks around the country in thinking proactively. Winfree hesitates to discuss the next steps, though, because funding for climate change preparation has dried up at the federal level. For the time being, he says the workshops have succeeded in introducing the concept of climate change planning to employees and hopes they will transfer these skills back to everyday decision-making. Decisions made in the next five to ten years will lay the groundwork for navigating climate change as it continues to impact the state. Alaska’s glaciers are receding, and a fourth of them are in national parks. 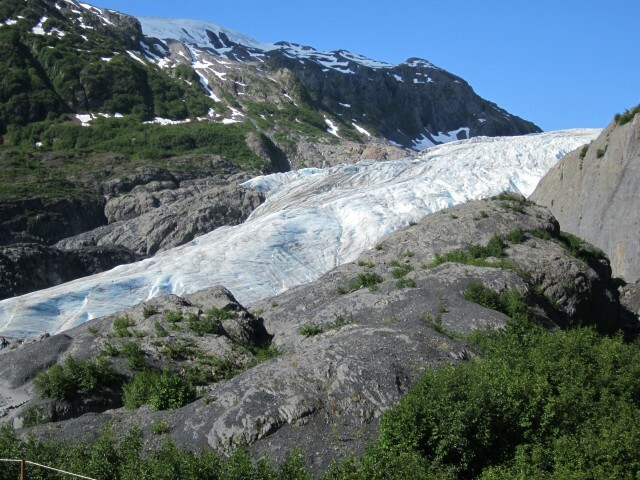 Runoff from this melt could cause flooding at the base of one of Alaska’s most popular glaciers, Exit Glacier in Kenai Fjords National Park. The Denali Park Road, a dirt path carved into steep mountains and traversed by hundreds of thousands of visitors a year in Denali National Park, is shifting with thawing permafrost and subject to landslides which could increase with warmer temperatures. The park service is constructing buildings atop special pilings that can be cooled as permafrost, which is found in 10 of Alaska’s parks, starts to thaw – a necessary adaptation that cuts into project budgets. Overall, infrastructure costs will increase 10-20 percent as climate change sets in. In the park service, this new paradigm of accepting and planning for these futures is beginning to take hold. In 2010 at the start of the scenario planning project, Ernst was as a summer intern at Klondike Gold Rush National Historic Park. She got a sense that park employees were uncomfortable with the fate of climate change. “A lot of people in the park service were not really sure what to do with it,” Ernst said. “There was still this sort of gap between talking about it and what to do about it.” But Winfree thinks times have changed. “We’ve been doing that thinking for several years right now and it’s becoming more the norm to think about change than to think about the conditions being static,” he said. Editor’s note: This post is part of a mini-series in which Scienceline reporters write on location from around the globe during winter break. See related posts for a story on how the Thames Barrier in London will weather climate change and check back this week for a report on putting radio collars on bustards in India. Overall, this is a great summary of the climate change scenario planning the NPS has conducted in Alaska. Scenarios are not predictions of the future; they are “plausible, relevant, challenging, and divergent” possible future conditions based on the best available science and modelling. Our goal was to ask “what if?” questions, and then make sure we are prepared to meet those challenges into the future. We recognized it is important to work with a wide array of stakeholders and personnel to ensure relevant issues were addressed in creative and useful ways. The other unnamed colleague who applied for and obtained the funding the was me, Bud Rice! There are not 23 national parks in Alaska, but there are 23 National Park System units. Many are parks, others are monuments, and several are preserves. We usually think there are 17 management areas, but several are dual units as a park and preserve. There are 6 of these as in: Denali National Park and Preserve, Gates of the Arctic National Park and Preserve, Glacier Bay National Park and Preserve, Lake Clark National Park and Preserve, Wrangell-Saint Elias National Park and Preserve, and Aniakchak National Monument and Preserve. I don’t think NPS areas in Alaska comprise 75% of all NPS areas, but they do account for more than half of the NPS-managed lands in the USA.